Graphing Calculator 3.5 or 4.0 is suggested for these investigations. Some of them could be done with a TI-83 or similar hand-held technology. When a and b are equal, and k is an integer, this is one textbook version of the " n-leaf rose." for various k. What if . . . cos( ) is replaced with sin( )? 2. 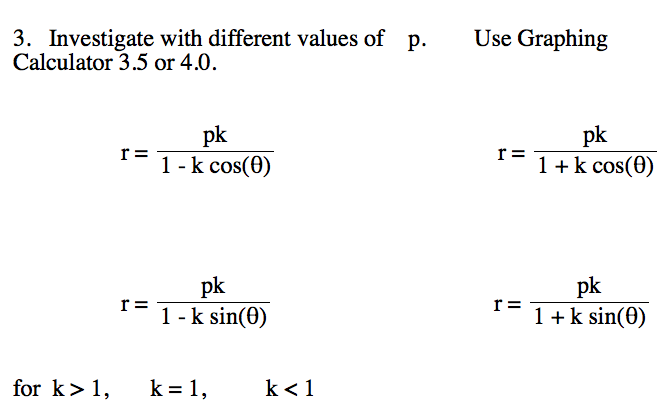 Investigate -- varying a, b, c, and k.
Note: The parameter k is called the "eccentricity" of these conics. It is usually called "e" but for many software programs e is a constant and can not be set as a variable. For notes on a derivation of these formulas, click here. Replace the '10' with n and animate for some appropriate range.